Since the beginning of the year, we’ve seen more and more terrazzo being introduced into interiors, and I expect the craze to grow stronger in 2017. It is one of the most trending materials at the moment. Consisting of marble, quartz, granite or glass chips set in concrete, this traditional flooring material is making its way to home accessories and beyond. It might remind some of you of the 90’s, but it gaining in popularity for its polished look, thanks to a clever and contemporary use on everyday objects by hip designers. With its distinctive and often colourful confetti pattern, terrazzo is less classic than marble and more playful than concrete. 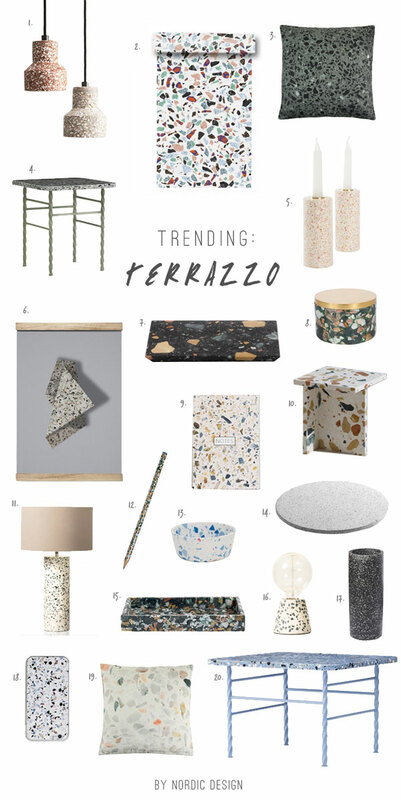 You can view my inspiration board for the terrazzo trend here. Below, I’ve selected twenty of my favourite terrazzo finds. Do you spot anything you like? I love terrazzo so much!! I could buy them all of that list!